The Gold Mine: House for sale; is move in works? 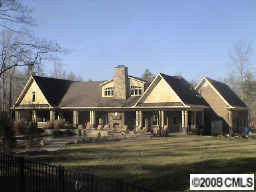 Yes, Charlotte 49ers men's basketball coach Bobby Lutz has listed his home in Harrisburg for sale. No, that does not mean he already knows he is not returning as the 49ers' coach next season. Some astute members of the 49ers fan base located the listing for Lutz's home through Allen Tate late Monday night and some others shared the information on the ninernation.net Web site and of course the speculation took off. I checked with Lutz this morning to make sure nothing had changed since last week when it was announced the school and Lutz had started negotiations for a contract extension. His contract expires at the conclusion of the 2008-09 season. Here is the summary of what Lutz said: Nothing has changed since last week and this decision on listing his home has been in the works since before Christmas. He and his wife, Janet, are basically just "testing the waters" and making long-term business decisions regarding the home, which funny enough is listed with an asking price of $1,699,049. So for now, no need to sound the alarms. However, if you're interested, I'm sure Lutz is open to all offers. Here's the listing. Love the $49 in the price-tag. Long term business decision, eh? It's time to put this BS behind us once and for all. If he's gonna be our coach....then sign him and be done with it ! We've made too many strides this season and have one good recruit signed, and another scholarship available, and I don't want to hear anymore of someone going elsewhere because of this contract nonsense. Either sign him or so you're not !!!!! I saw were Wednesday is Pack the House night! Does this mean Lutz wants us to help him move? ?